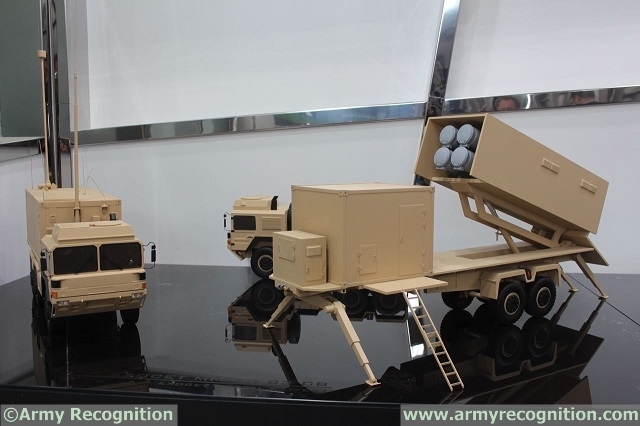 Our colleagues from Army Recognition, who are currently covering the KADEX 2014 defence exhibition in Kazakhstan, have learned an exclusive naval news: MBDA unveiled for the first time a new mobile coastal battery based on the Exocet MM40 Block 3 anti-ship missile. Denis Couillard, Naval Systems Senior Executive at MBDA, presents the new Exocet MM40 Block 3 Coastal Battery to Army Recognition during KADEX 2014. In the eighties, MBDA developed and produced mobile coastal batteries based on the previous generations of Exocet anti-ship missiles (block 1 and block 2). Five years ago, MBDA introduced a new generation of Exocet missile, the block 3. The firing unit consists in a semi-trailer that may launch four missiles. The tactical and operation center, is the control unit that will interact with the launcher. It can command and control up to four firing units. The newest MM40 version (MM40 Block 3) has an improved range in excess of 180 kilometres (97 nautical miles) through the use of a turbojet engine, and includes four air intakes to provide continuous airflow to the engine during high-G manoeuvers. The Block 3 missiles accept GPS guidance system waypoint commands, which allow them to attack naval targets from different angles and to strike land targets, giving them a marginal role as a land-attack missile. The Block 3 Exocet is lighter than the previous MM40 Block 2 Exocets. Exocet MM40 Block 3 is in service with the French Navy on its Horizon class frigates and will equip its variant of the Franco-Italian FREMM frigate. It has also been ordered by several other export customers.